You would be forgiven for having not heard of Steven Knight’s relatively low-budget thriller Locke, released in the spring of 2014. It’s a film starring Tom Hardy that unfolds almost entirely inside a car. To be put off by the simple premise on the other hand is unforgivable, for a number of reasons. Hardy plays Ivan Locke, a construction site manager with a series of problems in his life that would make even the most competent man melt into a puddle of hopelessness and despair. The versatile actor is exceptional as a one man screen presence, playing a role that requires a great deal of subtlety to provide intrigue for almost 85 consecutive minutes. But it is the film’s masterful screenplay that ensures this tightly wound drama is engaging from start to finish. The multitude of emotional phone calls Locke makes in his car over the course of the night provide us with all the succulent action to sate the audience’s appetite. To elaborate any further with regard to the plot would possibly spoil the joy of the many dramatic revelations, but rest assured this film is much more than just some bloke having a meltdown in his BMW. So what would be the reasoning behind making a film that doesn’t deviate from its single setting? An all too straightforward answer would be because of the low cost. Another would be the originality that sets it apart from the more expensive thrillers that pride themselves in using elaborate sets and exotic locations. Steven Knight’s film however only uses the interior of a car because the suspenseful narrative devices depend upon it. The filmmaker’s self-imposed limitations allow us to imagine the worst of the chaos that is unfolding around Locke as he attempts to solve his problems whilst driving down the M4. 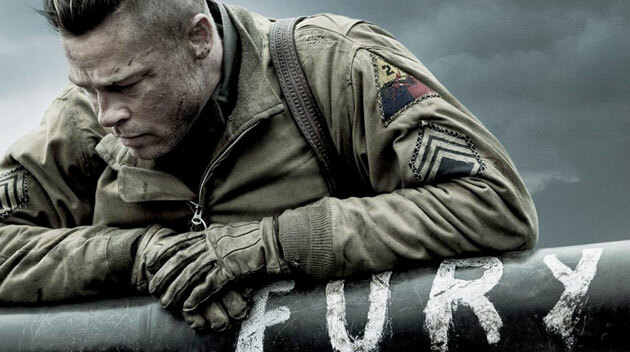 A much more recent and commercially successful feature this year was David Ayer’s Fury, a World War II drama that is enjoyable and grisly in equal measures. Set in the final days of the Nazi regime, Brad Pitt leads a dishevelled tank squadron towards the center of war-torn Germany in a bid to sweep out any resistance. The film is expertly shot, capturing shellfire and human casualties in hellish detail. The only things that felt out of place were a half-baked love interest and Pitt’s ridiculously sculpted physique. Ayer’s somewhat macho sensibilities may be forgiven, but perhaps there is something missing from the tank warfare drama that halts Fury from becoming a truly poignant feature. Samuel Maoz’s 2009 film Lebanon tells the story of a tank crew fighting in the first Lebanon war of 1982 on a battlefield where civilians and hostiles are virtually indistinguishable from each other. Save from a handful of exterior shots, the action takes place entirely in the sweaty confines of the tank. We only ever see the potential enemies from the tank gunner’s dispassionate green scope. This and the relentless mechanical groans from the vehicle perfectly serve to emphasize the inhuman nature of the conflict. The claustrophobia of Maoz’s mise en scène effectively stifles the viewer with fear and exhaustion. For the Lebanese tank crew searching a potentially hostile town, the threat is unknown yet all around them. Perhaps it may be unfair to compare Lebanon with David Ayer’s latest feature, but there certainly are parallels to be made that stretch beyond the mere involvement of tanks. Brad Pitt’s men are also immersed in a conflict where the battle lines are blurred. Simply from looking into the weary eyes of ‘Wardaddy’ (Pitt) we know that despite the war drawing to a close, the German resistance is stubborn and has continued to ravage the Americans’ dwindling armed forces. We see Tiger tanks lurking in tree lines and desperate Nazi soldiers armed with anti-tank missiles scuttling in the undergrowth. But there isn’t the same sense of surrounding terror that is present in Maoz’s film. Fury is rich in visual detail, though perhaps it could have benefitted from alluding to some of the horror surrounding its main characters rather than showcasing it. Maoz and Knight’s films show us that confining your camera to a single place can illicit powerful audience responses. As the viewer makes their assumptions on what we are not shown, the inferences soon turn to doubts and fears that intensify thanks to a pressure cooker effect engendered by the singular setting. To affect an audience so deeply and successfully through a purposeful use of place is no easy task; a level of masterful control is required to make every other film element engaging. You would only need to watch Alfred Hitchcock’s 1954 classic Rear Window to witness this. The voyeuristic nature of viewing characters through the telephoto lens of L.B Jeffries’ camera helps the audience experience the suspicion and paranoia of James Stewart’s character with great authenticity. Such uses of the camera along with the incredible set design are one of the many reasons why the film is still regularly talked about today. Prior to Rear Window, Hitchcock made Lifeboat in 1944, a film that also generated a great deal of tension from its single setting but is now somewhat overlooked. The ‘master of suspense’ clearly saw the potential for enclosing his characters in one place. Luckily for us, Hitchcock’s work clearly continues to inspire filmmakers like Steven Knight, creating films that use a single setting in a way that enthrals modern audiences. Odd though it may seem, directors can often discount the importance of place in their films. It is also true that unnecessarily shoehorning the action into one setting can prove to be fatal for a film with a flimsy script. Locke manages to avoid both of these pitfalls, which is why it should be considered as one of the best UK releases this year. So if you’re ever looking for a smart and simple thriller, spare a thought for the films of single setting.